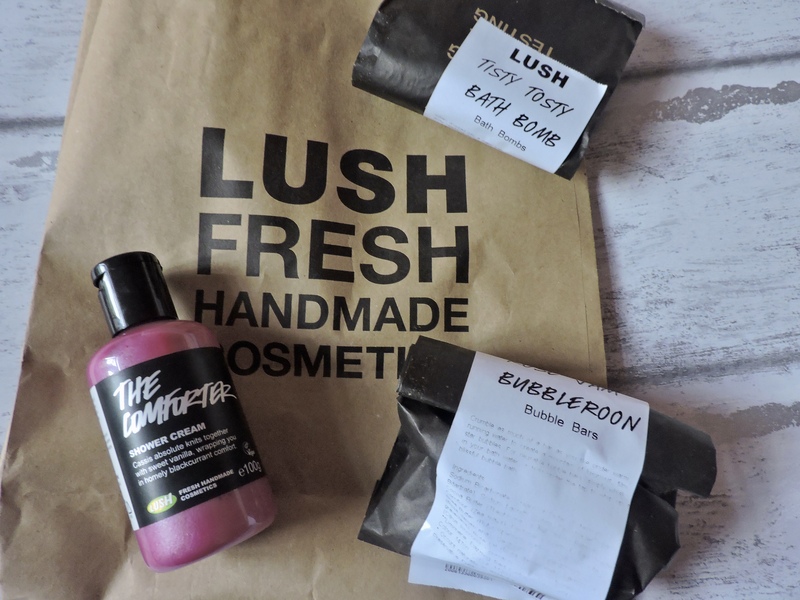 Lush is one of my all time favourite places to shop and receive gifts from. They are such an amazing bath and body shop that have something for everyone. I have been shopping at Lush for a very long time and have alway been satisfied with their products. Their stores are very popular and even if you haven’t been inside, I am sure you have smelt it ( literally, you always smell it before you see it ) Lush products make having a bath or taking a shower so much more fun and enjoyable and you know you are always going to smell amazing after. I received Titsy Tosty, The Comforter Shower Cream and Rose Jam Bubbleroon. Out of all three products, Titsy Tosty is the only one I have previously tried and it is one of my all times favourites. I have been meaning to try the Rose Jam Bubbleroon for a while now, it is one of those products that I see every time I go into the store, but for some reason I never pick up. I am so happy I have it now, as I can finally try it. This shower gel smells amazing!!!! It has a combination of cassis absolute, bergamot and cypress essential oils to create a delicious blackcurrant scent. It is literally the sort of scent that makes you want to eat it. The consistency in the bottle is thick but on the skin it becomes quite thin and easy to scrub on the body. The colour of the gel is a lovely fuchsia pink colour with a hint of shimmer and glitter. I didn’t find that the glitter transferred to my skin once washing it all over my body, but it did lather up a lot and it became really foamy on my body. The smell from this shower gel really lingers on your body which is something I love After using this, the smell of this shower gel I could smell for a couple of hours after which is something I love. 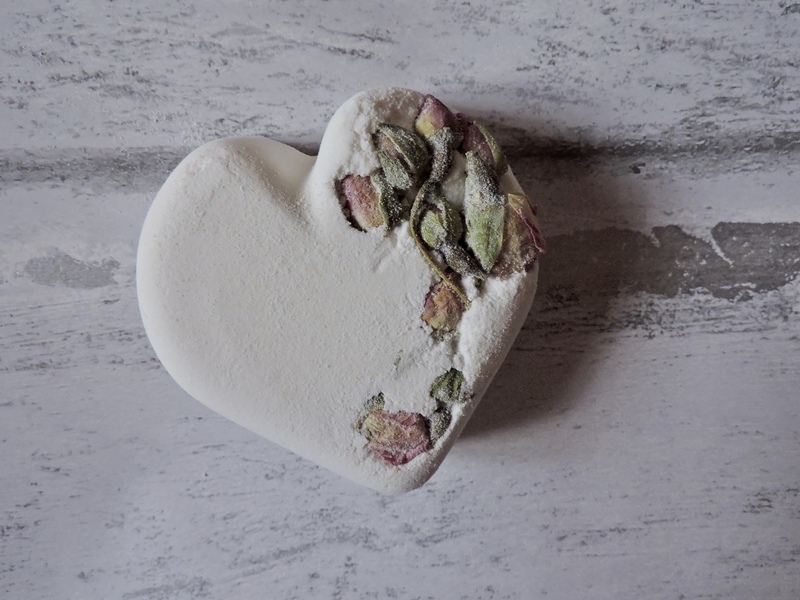 Tisty Tosty bath bomb- £3.50. AHHH this bath bomb is one of my favourites!! there is a combination of floral orris root powder, rose and lemon. All of these scents go well together to create a rich lemon floral scent. It is the sort of scent that when you smell it, you cough ( in a good way ) because it is SO strong and powdery. When you hold the bomb, there is transfer from the bath bomb to your fingers because it is really powdery, but this is to be expected. It is really relaxing and satisfying to watch/listen to it in the bath. While the bomb is fizzing away there are several rose buds that are released into your bath. This could be a turn off for some people, but I love it. When you hold the bomb the texture is really chalky and therefore will transfer onto your fingers. 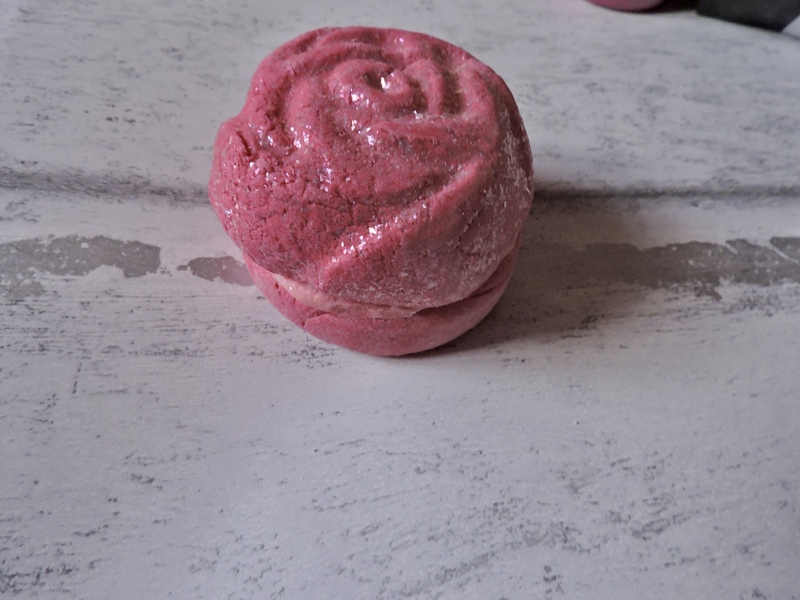 Rose Jam Bubbleroon Bubble Bar- £3.95. Up until recently I had never really used Bubble bars just because I thought I was a bath bomb kinda girl. Then I tried a bubble bar and was like WHAT?! they are now my favourite things to use as they create amazing bubbles! This bubble bar consists of lemon, rose and geranium oil which is supposed to help to perk you up, while cocoa and shea butter are released to make you feel soft. You crumble the bar under the running water and it creates amazing bubbles and leaves your bath pink. The bar itself was really easy to break up, however it did make my fingers pink and glittery. It leaves your bath pink and smelling like roses which is definitely going to help you to wind down after a long day. This is definitely to sort of bubble bar you use for a pamper evening, if you want to feel girly throughly pampered. Previous Post Do YOU know the dangers of driving in the sun??! I need to do a lush shop asap!! great post doll! I’ve heard so many good things about the comforter, love the pink theme with your products! I can’t believe you have never tried Lush before, oh I see! All of these products sound fab, I’ve never tried Lush! I LOVE Lush so much! I’m in desperate need to head to my Lush store and grab some more products! Have you tried the coconut hand scrub? It leaves your hands so soft! So do I, I am like that all the time. Lush is such an essential store that I need to go to, and no I haven’t tried that one before. I will have to check it out, thanks though! I really want to get the comforter shower gel, I had a smell of it last year in Lush and it was amazing, so wish I had picked it up! You should! I deffo think that it is one of those shower gels that I will be going back to! I bloody love Lush! I have a few products myself. I’ve always wanted to try Titsy Totsy!! The rose jam bubbleroon sounds absolutely fab, I’ll have to keep my eyes out for it. LUSH products are my absolute favourite! Everyone who knows me knows I’m a lushaholic, so of course I’ve tried all three of these products and their some of my favourites especially Rose jam scented products, smell like absolute heaven! My friend loves the comforter shower gel. I used to use the massage bar as I have back problems and it’s quite soothing. My favourite product though are the shampoo bars. They smell amazing but are so practical when travelling. Right now I’m using the New bar which snells of cinnamon and prompts hair growth (I’m currently growing out my hair to cut and donate). I only have a shower in my home, I miss baths just for Lush bath bombs! Oh I love lush and now I have three more products on my to buy list. I recommend Refresher Shower Jelly and Dragon Egg if you haven’t tried them there my faves! I think I have actually tried both if I can remember correctly! I know the Dragon Egg is very popular with everyone! 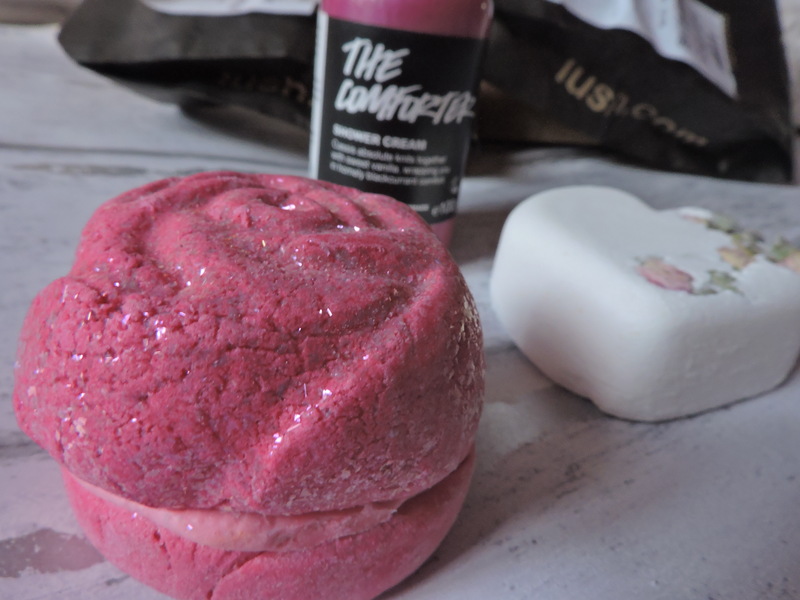 Absolutely loving that raspberry pink of the shower cream and bubble bar! I’ve never tried the bubble bars either, but from what you said, they sound delightful! This makes me want to go on a Lush spree!! Ahh Tisty Tosty is one of my favourites too! It’s absolutely gorgeous and I always find myself coming back to it. The bubble bar looks and sounds so lovely too, I’m definitely going to have to give that one a try! My favourite Lush product is the Guardians of the Forest bath bomb. I think it’s new and I’m hoping it sticks around. I feel like I most be one of the only people in the blogging sphere who hates the smell of Comforter! I can handle the bubble bar version because you can’t really smell it in the bath but otherwise I really hate the smell! I also recently received the bubbleroon and it’s really beautiful so I don’t really want to use it haha! NO WAY!! I think you are?! That is the first time I have ever heard that 😂, that’s how I felt, it is so beautiful I didn’t want to use it! I love Lush products, especially their lip balms and lip scrubs actually! I can’t believe I’ve still never been to a Lush store… I feel like if I went in there, I would just spend ALL MY MONEY! Ooo I’ve seen the Titsy Totsy bomb before, but I’ve never tried it. It’s honestly so pretty I don’t know if I could use it! I love the idea of being in a bath with rosebuds though. I suppose I have to try it now! 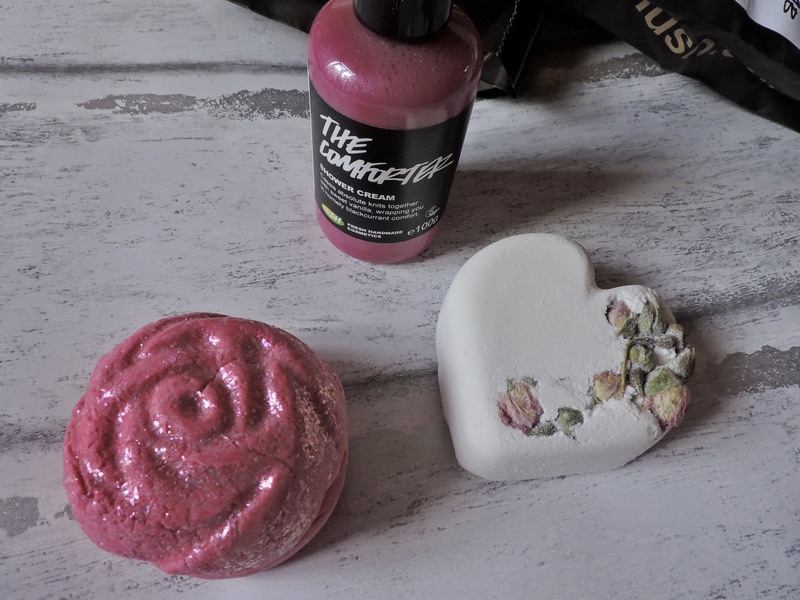 three of my favourites products in this post ☺️ lovely products! love lush. I always wanna buy Lush stuff but I’m little hesitant after my experience with some of their soaps. The soap was giving it colors when i try to wash my body and that was scary. Maybe I should use the shower gel like you did. Have you not have a good experience with those then? You maybe should talk to someone in store, I am sure some of the other products will be fine! Thank you, and thanks for commenting! I really want to try that shower gel the scent sounds right up my street! OK, so I have a hard time with Lush products because I used to eat shaving cream as a kid…….And I know that’s been 20 years, but I’m afraid I will just be sitting in the bath, running a marshmallow melt under the water and my childhood self will be like ” come on, what’s one little bite? Remember the shaving cream? haha! We all have our weird struggles! LOL!